We do agree that a leather jacket does not come cheap and this might be the reason you have been holding off buying this timeless wardrobe piece. 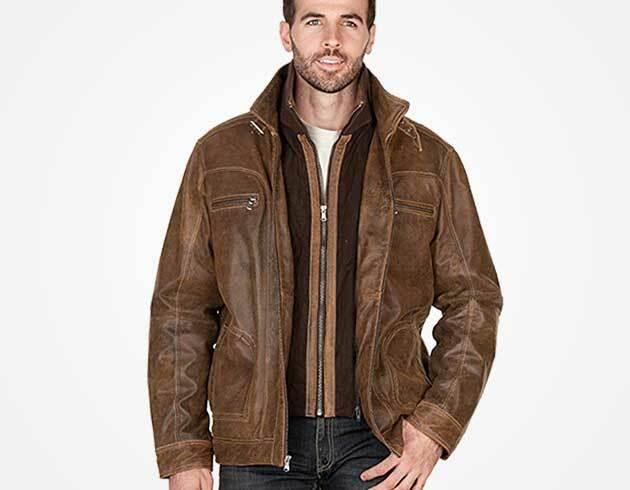 While we might not help you with the price factor, we can help you be a shrewd purchaser when it comes to buying an authentic leather jacket. The perfect leather jacket should fit right, have the right colour, and be made of quality leather. If you manage to buy such a jacket, it will be worth your investment. Like wine it will get better with age, and you will be able to team it with almost anything in your wardrobe. This guide is aimed to help you buy the perfect leather jacket. So, before you go shopping here is everything there is to know about this cool and versatile apparel. A classic leather jacket is one of the best items in a man’s wardrobe. It is inspired by past centuries leather jacket styles. It is not only cool, but it never seems to go out of fashion. So, what classic leather jacket do you choose for that great look? Here are four options that are bound to give you sartorial elegance. The racer leather jacket first came into the market in the 60s. It was popular with British motocross riders who wanted a fashionable leather jacket that was not bulky. Since it is meant to protect racers, it is often made of thicker leather. It also has plates sewn on key body areas such as shoulders and arms. This classic is characterized by a single breast zipper, an elastic waist, and a stand collar. Also referred to as the moto jacket, this is a simple jacket that has minimal pockets and buckles. Wear it with a pair of luxury jeans, a V-neck t-shirt or a buttoned-down shirt for a casual smart look. Another minimalist classic that was originally made for the bomber aircraft crew. It often has a turndown collar that is often lined with corduroy or fleece. It has a zip up front and an interior lining made of heavy and warm fabric. The jacket also has a snug waist and elastic sleeves. Due to all the warming details, the bomber is perfect for fall and those cold winter days. Since this jacket has a paddled look, buy one that does not have excess material hanging on the sides or under the arms. 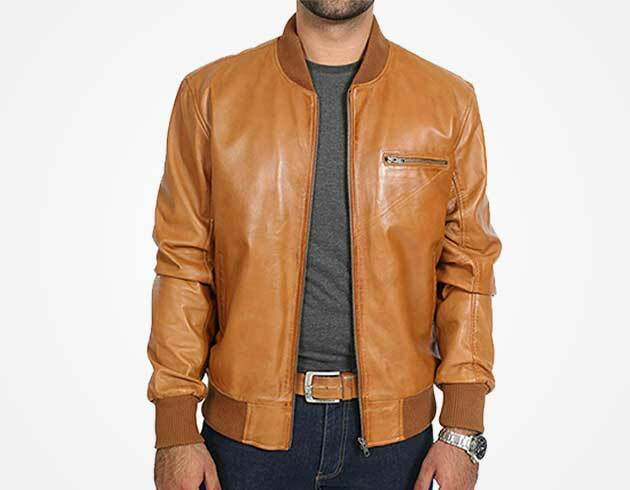 This is a jacket that looks great on slim built men who wear it with denim jeans, a simple T-shirt, and coloured sneakers for that everyday casual look. You probably know this jacket from the film Wild One. Marlon Brando wore it while perched on his motorcycle. 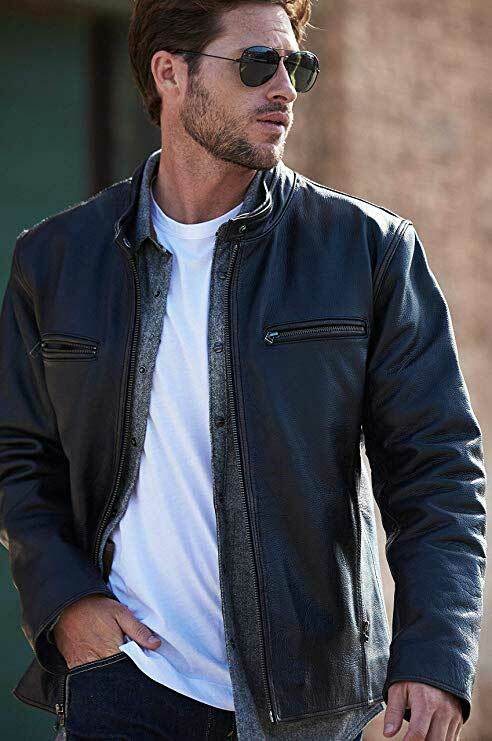 This is a common leather jacket style that you will probably find anywhere when you go looking for a leather jacket. This jacket comes with an angled zipper at the front, plenty of zips, studs, buckles, and large lapels. This is a countryside classic that was famous with ranchers and cattlemen. It is easy to recognize it due to its length that is slightly below the waist. Instead of zippers, it has buttons at the front and a slit on the back. The jacket has minimal detailing on its edges with a turndown collar. This style is ideal if you do not like a lot of bells and zippers. It also looks good on short men as it helps them appear a bit taller. A modern leather jacket gives you an undeniable edginess. In the modern world, we have some leather jacket styles inspired by vintage styles but polished for today’s modern man needs. Here are our best two. You do not have to be a sporting god to wear the modern letterman leatherjacket. A notable difference that sets apart today’s varsity jackets from the classic ones is the material. They have moved away from cotton material to leather, suede and even nylon. Very similar to the bomber jacket in its build and shape, the leather varsity jacket adds some preppy leather style in your wardrobe. If you are looking for some cool urban vibe, go for a black leather varsity jacket. To keep your look even sleeker, team it with jeans that crop at the ankles or black chinos. A hoodie or a white t-shirt under your leather letterman jacket will give you the complete modern look. When you think of leather fencing jackets, think in the lines of Carol Christian and Rick Owens labels. This jacket is very similar to the fencer jackets worn during fencing competitions. The asymmetrical zipper or two zippers at the front of the jacket sets this jacket apart. It also has a curved front design. It is often worn by men who love high-end designs and those who want to make a statement. It’s good to be aware of the bits and pieces that make up a leather jacket. This way, you will know why a short tight collar will give you a more streamlined look compared to the common turndown collar. In this section, we pinpoint the things to look out for when you go shopping for your leather jacket. Short leather jackets look modern. The general rule of thumb is that your belt should be visible when you zip up your jacket. If you are going for a more rugged look, choose one whose hem is below the belt and which is a bit lose at the waist. If you are looking for something that will allow you to work outside the office, in the rain, or in the countryside, you are better off buying a leather duster or trench coat. These are longer and for practical reasons. They are also weatherproof, but their length should not go past your thighs. When it comes to choosing the best leather jacket, the devil is in the details. The lining can be the difference between a great and a mediocre leather jacket. If you intend to wear your jacket very often, you will want one with a lining. A lining protects your leather jacket. 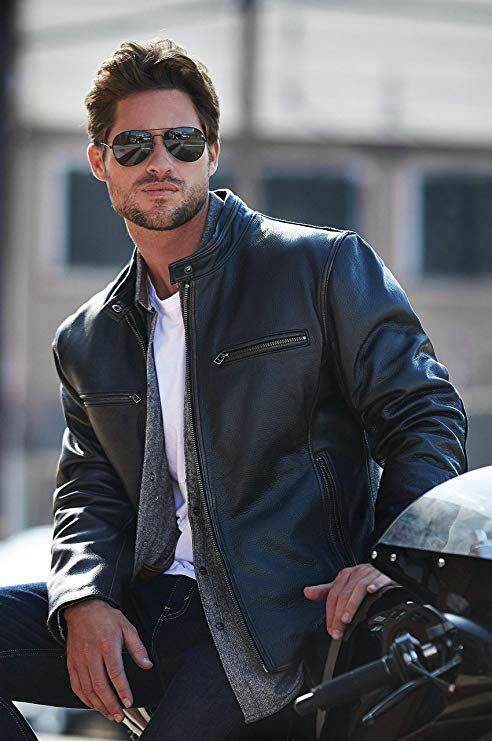 Additionally, a lined leather jacket will wear warmer compared to one that is not lined, and it will give your jacket shape for a perfect fit. Look out for a lining made of breathable material such as mesh, Bamberg, satin, pre-cotton, or cotton. For a warmer feel, go for one with a fleece or Sherpa lining. Pockets can be for functional or aesthetic reasons. If you are looking for a streamlined look, go for a jacket with besom pockets or one with a sewn front pocket. A jacket with pockets that have flaps or buttons gives you a casual look. Trendy styles will have large patch pockets or many pockets on the exterior. Zippers and buttons can help you determine the quality of your jacket. No designer will put a custom branded zipper on a low-quality jacket. When it comes to convenience, zippers are preferred to buttons as they are easy to open and close. On the other hand, buttons are easy to replace. Zippers are common on the moto and rider jackets as they protect the wearer from the wind. Buttons are common on cattlemen jackets since they can easily pop off under pressure without damaging the jacket. How a leather jacket fits can make or break your overall look. A leather jacket should fit like a suit, not too tight or too bulky. Since it is made of a natural material, if you buy one that is too big or too small it will be impossible to manipulate sartorially. Here are the dos and don’ts when it comes to selecting a leather jacket that fits right. Dos: When you go shopping fit a few pieces to get the right fit. Leather will stretch out with years so ensure you have around two inches of extra fabric after you fit it. A good fit will have the bottom hem fall right at the waist unless you are going for longer leather jacket styles like the cattleman or the trench coat. The length of the sleeves should end at the wrist or near the joint base of your thumb. The shoulder seams should be at your shoulder points. Don’ts: Don’t go for boxy and too-snug fits since they will look and feel uncomfortable. Remember a leather jacket will last for many years and thus a too-snug fit might not accommodate body changes in the future. A length that touches the middle of your trouser pockets is not the best as a very long leather jacket will make you look shorter. For That Winning Look, Does The Leather Jacket Color Matter? Yes, a leather jacket colour does matter. It determines if you can wear the jacket for many years to come and what you can pair it with. Since a leather jacket is an investment piece, you are better off choosing a natural print. Black, brown, tan, grey, or beige are colours you will never get sick of. Additionally, these colours are always in style and can be paired with anything. How Much Should a Leather Jacket Cost You? When it comes to leather, it is hard to buy something good at a cheap price. For a quality leather jacket, set aside $1000 or more. If you find the named price a bit high do not despair, you can get a vintage jacket for a cheaper price but be sure to examine it in person. The below pointers will help you determine if you are paying the right price for your dream leather jacket. The construction quality of the jacket will determine its price. Consider if the leather has rolls to it, are there loose threads, do the seams around the zipper lie flat, or does the collar ripple. Such factors can help you decide if the construction is of high quality or not. The most expensive leather jackets are made of pure leather. Pure leather is soft and supple on the skin. It has an uneven texture too. Cheap leather jackets will be made of corrected leather that is treated to look like real leather. If you touch it, it will feel excessively smooth like plastic. This kind of leather will eventually break or crack which means it is not worth your investment. Topstitching is a decorative, thick, and visible stitching done on the pocket and seams edges of your jacket. Well-designed leather jackets will use topstitching to add an edgy look on the jacket. Budget leather jackets do not have topstitching, and you will notice this due to the thin threads used on the edges. The use of thin stitching is a less obvious way of lowering production costs. The more the details, the more likely you are to pay for the jacket. Look out for additional details on zipper, seams, cuts, and pockets. A detailed jacket means it was expensive to produce and it took the designer more time to design. If the jacket hangs like a sack, it is probably cheap. Brands that sell cheap leather jackets will go for a more generous cut. The goal is for the jacket to fit as many people as possible for higher sales. Check the sleeves or armholes. Lower armholes accommodate for many body types while higher armholes make for a better fit. If the jacket is customized for each customer or made to measure, that is likely an expensive and quality jacket. So, now you have a budget for your leather jacket. However, in a minefield of leather jackets, you might be tricked into buying a fake leather jacket. So, how do you differentiate between faux and real leather jackets? Let’s learn, shall we? Smell the leather. 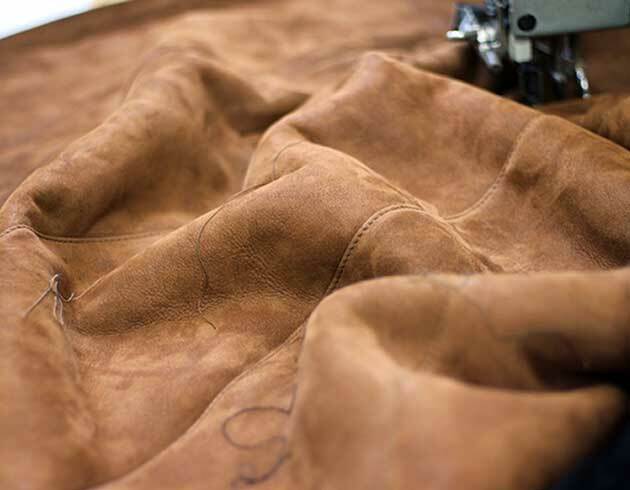 A jacket made from fake leather will smell like chemicals or plastic. If it is real leather, you will know by the smell. Read the labels. The label can tell you if the jacket is made from real quality leather or not. Here is what the labels mean. Full-grain – This is the most expensive of all leather types. It is also the best in quality. It has patterns on the skin. Made with full grain – This means that though the jacket is made from genuine leather only a part of it is. For instance, the sleeves or pockets might be made from another cheap material. Top grain – This is made from leather whose top surface has been sanded away to make it more flexible. You will not see any leather patterns on it as it has a finish coat. It is also more affordable compared to full-grain leather made jackets. Corrected grain leather – This is leather which has very minimal top-grain leather. The jacket is given a velvety finish to look like real leather. Genuine leather – Do not be fooled into thinking that this is the best leather jacket. It is often made of the leather that remains after making good leather. This low-quality leather is attached together with glue, and that’s why the layers might fall apart very soon. Bonded/ reconstituted leather – This is made up of mashed leather scraps that are spread over another fabric. It is likely to peel and flack with age. Rub, bend, press or use the water test on your leather jacket. A jacket made from real leather when pressed will wrinkle rather than retain its shape. Real leather also easily bends. It also changes color and wrinkles when you rub it. Additionally, rubbing it gives it a permanent shine. If you put a drop of water on your leather jacket, it will quickly absorb it if it made of genuine leather while the water drop will puddle on faux leather. The type of leather used on your jacket determines the feel of the jacket, durability and even function. Different types of leather have their own strengths and characteristics. This is why it is important to know what makes a lambskin jacket softer than one made from cowhide. Most biker and motorcycle jackets are made from cowhide due to its protective qualities. It is tough and lasts longer. Due to its strength, it provides great insulation to the body. It is also water and dirt resistant. It also looks good though it might feel heavy on the body. Goatskin leather is very light. However, this does not mean it is not durable. It is known for its softness and smoothness and its comfortable pebble grain. 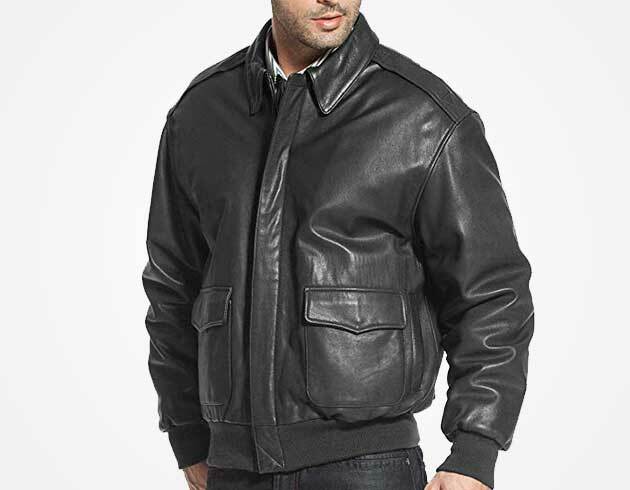 If you are looking for the softest and most comfortable leather jacket to wear, look for one made from lambskin. Its flexibility means it can be used to make full-length or cropped leather jackets. It also has a very luxurious texture on the body making it a darling for many leather jacket fans. A leather jacket is likely to put a dent in your wallet. Even if you pick one for a few hundred dollars, you will find there is something off with it. Maybe the colour is not right or even worse the quality of leather used is not worth the price you paid for. 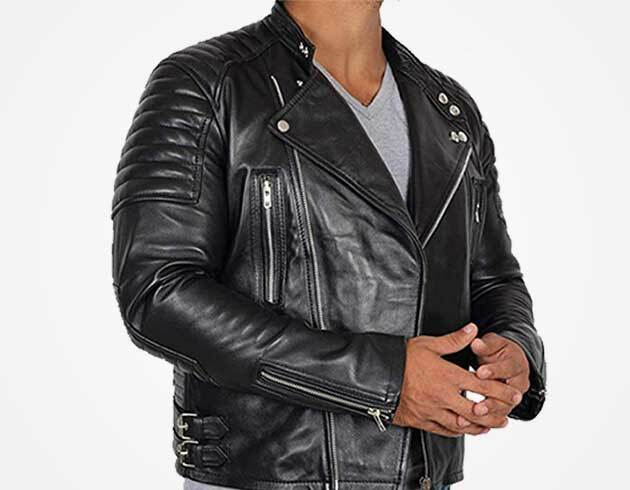 To get a leather jacket that is worth its price, consider buying from reputable brands. 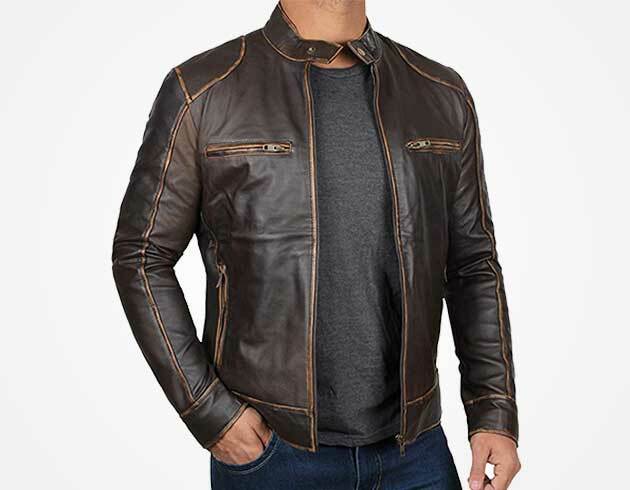 Below are a few leather jacket brands that will give you quality at the right price. Belstaff is a UK brand that is known for its sporty and elegant apparel. Most of its leather jackets come in belted style. These jackets are also cotton-waxed making them waterproof and comfortable against the skin. This is a brand that even celebrities such as David Beckham, Brad Pitt, Tom Cruise, and Will Smith swear by. We feel you won’t go wrong with a Belstaff leather jacket. This Swedish brand is known for its high street pieces. If you are on a budget, H&M offers both real and faux leather jackets for men. However, with this brand, you can be sure of quality jackets even if they are made from faux leather. You can get both classic and contemporary styled jackets that are worth every buck. RRL stands for Double Ralph Lauren. The inspiration for this brand’s apparel comes from classic western movies that its founder Ralph Lauren grew up watching. The brand’s leather jackets are classic in style and have a jagged spirit of the untamed American West. With RRL, you will get an iconic and timeless leather jacket that is bound to get better with age. All Saints is a London-based brand founded in 1994. This brand is known for its sleek leather jackets that often catch the attention of fashion enthusiasts. All Saints leather jackets have a rock n roll style ideal for men looking for a high street look. They have a variety of bikers and bombers jackets that come with distressed finishes and a relaxed fit. Irving Schott is known for designing the first ever Perfecto leather motorcycle jacket. The Perfecto took the leather jacket fashion scene by storm in the 80s. It was the jacket that Marlon Brando wore in the film Wild One. Today, the brand is known for this iconic piece in addition to its quality racer and flight leather jackets. Whether you are looking for a rebellious biker jacket or just a quality jacket for any season, Schott has it. We hope this guide makes it easier for you to shop for that elegant leather jacket. If you have something to share with us regarding this topic, we would love to hear from you. Feel free to leave a comment on our comments section and let’s keep the conversation going.